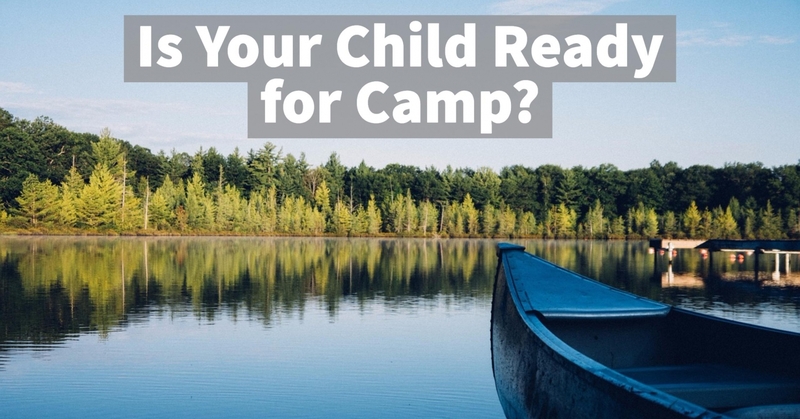 Home » Articles » Is Your Child Ready for Camp? Questions for parents to consider. Summer is quickly approaching, and maybe you've been giving some thought as to whether or not your child should go to camp. Day, sleepaway, or specialty — whichever camp you're considering, taking the step to send your child to a summer program is a big deal. It's important that the child is ready and meshes with the camp's philosophy. Ponder the following questions to assess a child's readiness for the camp experience. What type of child do I have? Think about your child's strengths, interests, personality, and readiness for new experiences. Considering these things will help you determine whether your child is ready for camp and what type of camp might be the right fit. When researching a camp, make sure to tell the camp director about your child. Describing your child will help the director know if the camp is the right camp for your child. Is your child interested in camp? Ask yourself how your child became interested in camp. Did you bring up camp, or did your child broach the topic? If you brought up camp, does your child sound excited about it? Is your child asking about the activities and what a typical day at camp is like? Camp decisions should be made together. The more involved children are in the process of choosing a camp, the more successful the experience will be. Day camps are designed for children ages 3 and older and are often a child's first experience away from home for a long period of time. Children can go to overnight camp beginning at age 7. It's important for parents to understand that just because a child reaches a certain age, it doesn't mean he is ready for camp. Consider whether your child is able to be away from you easily or enjoys trying new activities. If you are considering sleepaway camp, make sure your child shows interest in going away and you aren't just sending your child because he has reached a certain age. If you are considering overnight camp, has your child had successful overnights? If your child is showing interest in overnight camp, has your child had successful overnights away from home with friends and relatives? Consider if these overnights were easy or difficult for your child. Keep in mind that just because a child's friend is ready for overnight camp, it doesn't necessarily mean your child is ready yet. You want to make sure your child has an interest in going away and is mature enough to independently do certain things such as showering, brushing hair and teeth, and dressing. Preparing your child for camp and what to expect there will help your child have a positive outlook about camp. Learn about the camp ahead of time. When possible, tour the camp the summer before attending to allow your child to see camp in action. Visit the camp's website together, and read about the activities, special events, staff, and bunks. If the camp you are choosing offers open houses or a new camper get together before the summer, attend them when possible. They will give your child the opportunity to see the camp, meet other campers, and get to know the staff. These types of preparations will make your child feel more comfortable as the first day approaches. Are you able to share consistent positive messages about camp? Parents should let their child know they are confident in his ability to have a wonderful camp experience. As camp approaches, it's common for children (and sometimes parents) to feel uneasiness. By sharing positive messages about camp, you will be helping your child feel good about going to camp, and you will be setting him up to have a great summer.